Our U-pick Calendar Begins Updating in May of Each Year. 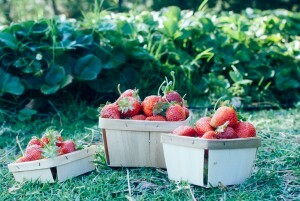 Because of our altitude most crops ripen during the May to October Period. We will be reporting mid-week as to whether there are enough apples left for u-pick. The Red Astrachan is the “heritage” apple located in the “Upper Monster Orchard.” It has a sweet but tart taste – but even kids will love it. It is a “lunchbox” size apple this season. Excellent as a dessert apple and for cooking. It will not keep well though. History Lesson: It is originally a Russian apple – that made it’s way to Sweden, then to England in the early 1800’s. It was then imported to the United States in 1835 via the Massachusetts Horticultural Society. 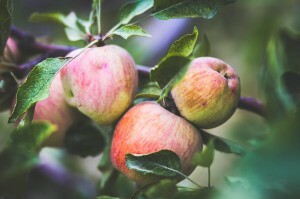 It used to be the most widely distributed apple in the United States in the early 1900’s, along with the Winesap. It is also known by other names such as “Abe Lincoln”, “American Red”, and “Waterloo”. Standard Delicious: A good, sweet eating apple in the Colonial Area. There are not many of these trees in this area. There are also a few Standard Delicious in the Upper Monster Orchard. The York Imperial is a beautiful yellow and red apple that is complex in taste – much like the Snow apple. May not please the palate of a child – but DEFINITELY an adults – great for a dessert apple and for cheeses, salads ect. York Imperial is also the leading apple variety in Pennsylvania. Originating in York, Pennsylvania in the 1800’s on the farm of a Mr. Johnson, York Imperial soon became a favorite of growers for its long-keeping abilities and fine processing qualities. It is also known as “Johnson’s Fine Winter”, “York” & “Shep”. Galas: our remaining apples of this variety are a little small and not great in color or flavor. Buyer beware. Spitzenberg: The Spitzenberg is the famed variety as being one of Thomas Jefferson’s favorite apples, and several of the trees are planted at his Monticello Home. Another complex apple like the Snow, but it does have a bit more tartness to it. Glen Seedling: The “original” to Oak Glen (it only grows in the Glen) – great apple for cooking or eating (by a more refined palate) – this has been selling like hotcakes and we only have 3 Bushels left! Golden Russet: Another heirloom apple. The skin can be tough or “russeted” and in the old days this feature was favored for long storage. Tastes vary again on this one. Some prefer them for baking. Mystery Apple: This is off a tree in the Lower Monster and it has been on the farm so long that no one knows what it is. Lunchbox size and red, it it very reminiscent of a Red Delicious, but different enough that we know it is not. Sweet. Good for kids. 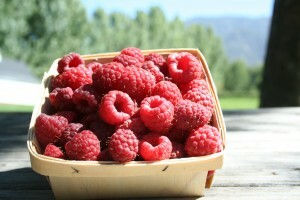 We’ve been growing raspberries for several years now, with lots of success. Raspberries have done so well with all of our devoted pickers, we quadrupled our crop size in 2007 and now those bushes are so productive we have to use the extra harvest in the kitchen for shakes and pies! 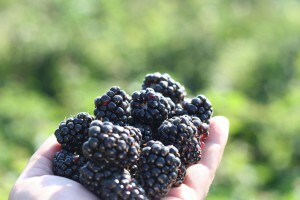 Like our blackberries, all of our raspberries are pesticide and herbicide free. Come up and try ours, and you might not want to get a raspberry from anywhere else! All of our pears are Bartlett (also known as Williams) variety, which was originally derived from the European Pear. Bartletts are one of the firmer pears, which means not only do they taste great by themselves, but are one of the best pears to cook with. 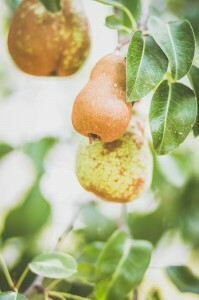 Bartletts are also considered a “summer pear”, as they’re a bit less cold tolerant than the d’Anjou, Comice or Bosc varieties, all “winter pears”. But that’s good news for you, because it means that our Bartletts ripen quicker. See, pears aren’t like apples, which are best when freshly picked. Pears ripen off the tree, not on it. Once our pears turn from green to yellow, they’re mature and ready to pick. In order to ripen them, however, we recommend placing them in a paper bag on a cool spot (65-75 F) on your counter for a few days, checking them once a day. When you can hold a pear in your palm with your thumb just below where the stem meets the skin, and the pear feels a bit tender under even pressure, it’s time to enjoy it! All fruit is sold by weight. $3.00 per lb. Oak Glen is famous for its apples, and we’re proud to have one of the largest orchards in The Glen. We also support a large assortment of apples, with over 30 varieties. We have trees that are over a hundred years old, planted by the original Oak Glen family, and we have trees less than a year old. Every year we plant new trees to restore old orchards that have been forgotten or damaged. We specialize in “heirloom” apples, which are apples that have been all but forgotten until recently. Modern grocery store culture has bred the flavor and life out of many varieties in order to get pretty apples that last on the shelves. While we have some modern varieties, our favorites are the ones we grow for their wonderful flavor and uses. Some of those apples may be a bit ugly or weather marked, but boy do they taste good! Whatever type of pumpkin you’re looking for, we’ve got it! We love to try out new varieties every year, and make sure to keep all of our favorites around. Our fields are several acres large, and you can hike out and pick out whatever pumpkins are perfect for you. This is another crop that has just exploded up here in Oak Glen. 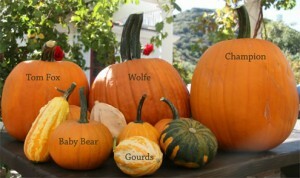 Just make sure you bring a few strong backs for hauling those pumpkins down the hills! If you don’t have any strong backs available, we try to keep the store stocked with a large variety too. And if your pumpkin is too big for any size back, we’ve got a tractor to load it up onto a truck for you.